Bovisand Lodge Holiday Park is a family-run, gold-award-winning beachside holiday park, we take great pride in the quality of our accommodation. Our beautiful, well-appointed caravans, lodges and apartments are the perfect complement to the stunning landscape which surrounds us. The fact that several private owners choose to make this location their home during our open months and that our holidaymakers return year after year highlights just what a wonderful place Bovisand is. At Bovisand Lodge Holiday Park we offer superb self-catering accommodation across luxury mobile homes, lodges and apartments. 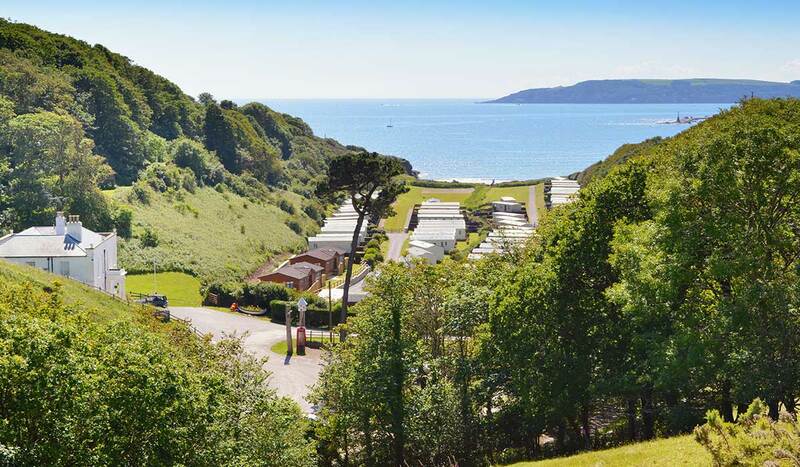 A truly unique spot that’s beloved by locals and visitors alike, our beachside holiday park lies at the edge of an unspoilt wooded valley and offers breathtaking views over Plymouth Sound and the rugged splendour of the Cornish coastline. The local coast paths offer spectacular rambling opportunities with magnificent backdrops and the tempting tourist attractions of Plymouth are just seven miles away by road. We’ve carefully developed the site so that there’s something for everyone. Our indoor heated swimming pool proves exceedingly popular during spells of inclement weather (always a possibility in the West Country!) and, when the sun comes out, the whole family can enjoy the play park and table tennis/badminton facilities. The beach at Bovisand is a popular spot all year round, perfect for wrapping up and enjoying a stroll in the cooler months and holing up for hours with a picnic and your favourite beach games in the spring and summer. Just seven miles from the conveniences of Plymouth city centre, Bovisand is the perfect place to escape from the daily grind and relax into beachside life. From short breaks to extended stays, our extensive site is ready to welcome you, Bovisand style. The holiday park is open from January to December and tariffs fluctuate according to season. So whether you want to stay in a cosy wooden lodge this Christmas or fancy holing up in a luxury caravan holiday home with the children in the summer, Bovisand Lodge Holiday Park has got it all in one spectacular location. Shake off those winter blues, head south and enjoy a short break at Bovisand. It’s like having a second home - but with a few extra luxuries thrown in for good measure. Short breaks are available throughout the year outside of the main holiday periods. With long weekends starting on Friday and running through to Monday morning, you could wake up on a Saturday morning with some of Devon’s finest scenery at your feet. Spend the weekend exploring the South West coast path, heading into Plymouth to potter around the Barbican or popping down to the sandy beach for a spot of rock pooling and safe swimming. If you’d like a bit more time, consider a midweek break. Four nights midweek costs the same as three over the weekend, so come on Monday and stay right through to Friday for an unbeatably relaxing break in tranquil surroundings. To check availability, simply browse the different types of accommodation, and click on search now. Book online today and you’ll soon be taking in some of the most breathtaking views in Devon, with all the creature comforts that you need. Bovisand Lodge Holiday Park provides the perfect spot to celebrate a family reunion, special birthday or get together ‘just because’. Mix and match your accommodation to suit your group and plan the celebration of a lifetime! If you need help planning your break, just give us a call on 01752 403554. Out side of the school holidays we can be quite flexible with arrival dates. So give us a call and we’ll do our best to accommodate your special requirements. We’re looking forward to welcoming you to Bovisand!